This playful and eclectic apartment is located in beautiful, luxurious Monte Carlo, and presents a bold design concept, full of character, courtesy of the creatives at Milan's Studio Donizelli. From the get-go the apartment's decoration is novel and striking, with unconventional shapes and styles used to create a home that you won't soon forget! The living area shines with sleek finishes and curved lines, with its contemporary furnishings and state-of-the-art multimedia system oozing luxurious, modern living. 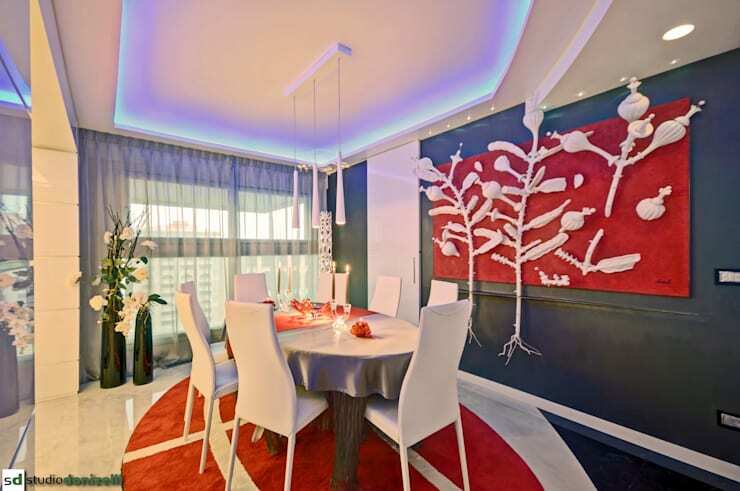 Bordering the living space is a vibrant and artistic dining room, with 3D artwork, vibrant colours and elegant floristry creating an eclectic atmosphere. The kitchen of the home continues this theme, with the sheen of its contemporary finishes contrasting against playful decoration, such as a smattering of rose-shaped dining chairs, while a large balcony borders the home, providing a stunning view of the seaside city beyond. This design definitely showcases the bold personality of its creators, providing plenty of inspiration to incorporate artistry and eclecticism within modern dwellings. Take a tour below and tell us what you think! Upon entry to this extraordinary home it's immediately evident that the designers are unafraid of bold colours and striking decoration, with the living spaces presenting a colourful and eclectic environment that delights with its playful sense of character. Concentric circles of marble and textile create an intriguing visual element within the living area, with its round, leather sofas adding to the curved effect. 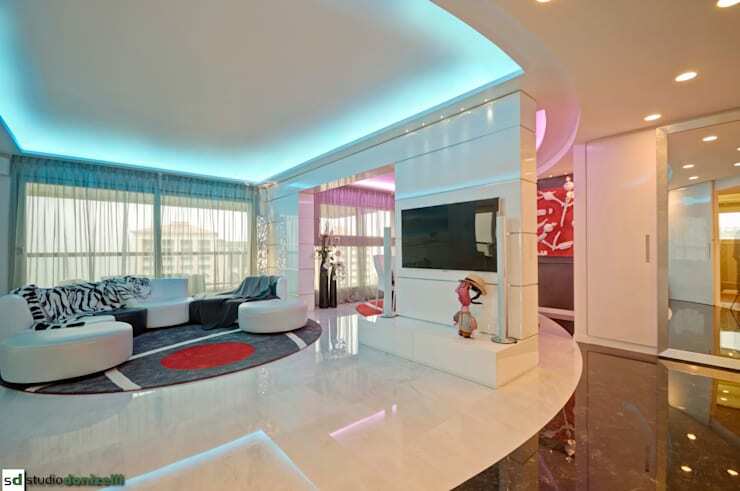 The sleek surface of a streamlined, contemporary partition sections the living and dining spaces, with a modern television mounted upon the wall, framed by state-of-the-art surround sound speakers and a unique caricature statue below. Beyond the white sheen of the partition sits this vibrant dining room, designed to delight and inspire with a 3D artwork popping out from the wall. The setting itself is novel and contemporary, with its silver table cloth evoking an air of the post-modern alongside the array of crisp, white dining chairs. Two tall, bottle green vases house decorative foliage, adding the refreshment of nature within the space, while the overhead lighting can be adjusted to beam multiple neon colours, enabling the creation of a unique ambience within the room at the whimsy of the occupants. The kitchen of the home rests in a sleek, white alcove, with its contemporary decor dressed primarily in white. Clean lines characterise the ceiling and storage, with the sheen of black emanating from the floor and kitchen benches. A curved, triangular table provides a place for casual dining, and is surrounded by a small array of rose-themed chairs, adding a playful element to the decoration of the room. 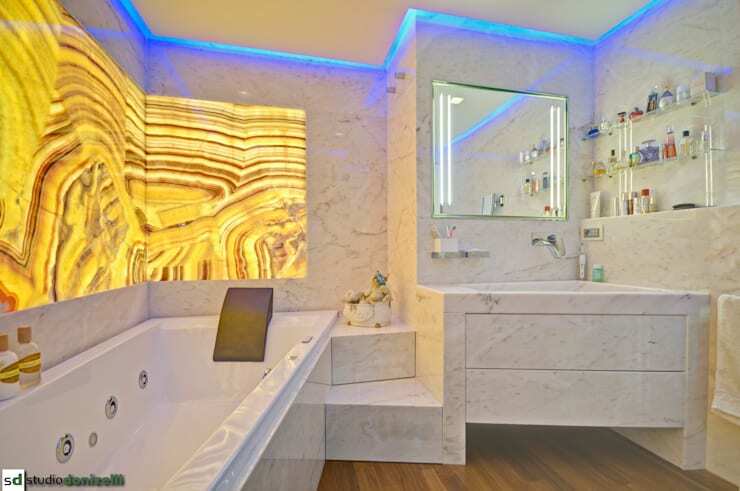 The bathroom of the home is brimming with modern luxury, with the walls, sink and spa each lined in majestic, white marble, and a glowing, amber-inspired feature streaming across the left hand wall. Wooden floors ground the space in a traditional material, providing a darker colour contrast within the room, while glass and marble shelves house a range of personal and decorative objects, infusing the space with an added layer of character. The crowning jewel of this fun and eclectic home is doubtless its expansive balcony, which looks out onto an impressive view of beautiful Monte Carlo. 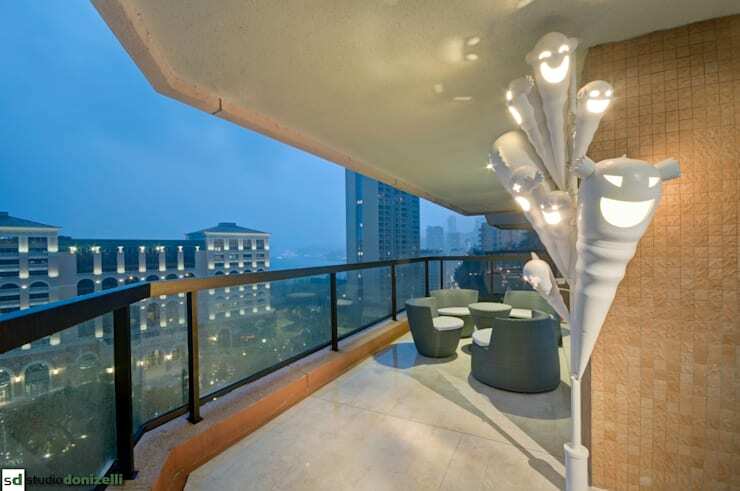 The decor of the balcony is understated relative to the rest of the home, with its smooth, stone floor and glass balustrade laying the foundation for an infusion of creativity. The contemporary curves of a circular outdoor setting prove perfect for the task, with additional playfulness found in the haunting, white lights welcoming visitors to enjoy the scenery. For more ideas and inspiration about playful interior design, have a look at This Bright and Eclectic Loft! 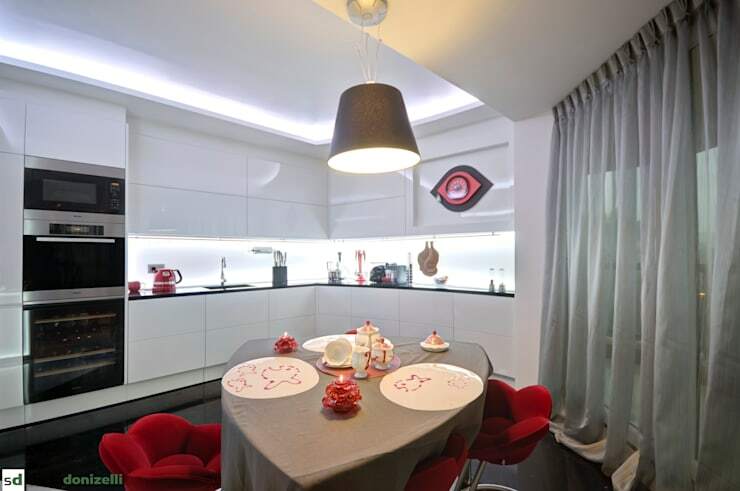 Do you enjoy the bold sense of personality infused in this luxury apartment? Tell us your thoughts below!